Need help with R, plotly, data visualization, and/or statistics? Hire me! As the maintainer of the R package plotly, I’m certainly aware that ggplotly() is not perfect.1 And, even when conversion from ggplot2 to plotly ‘works’ it can leave some things to be desired. For example, it might take a while to render, it might not look exactly the way ggplot2 does, and/or the default interactive properties (e.g., tooltips) might not work the way you want them to. In almost every case, these are issues that, with a bit of knowledge about plotly and the underlying plotly.js library, you can fix. That’s because, as long as ggplotly() returns an object, we can inspect its underlying data structure (which, by the way, is useful for learning plotly.js!) and improve on it by modifying that data.2 This post explores several ways to learn from, leverage, and improve ggplotly() conversions of ggplot2’s geom_sf() (which is still in development), but some of the same lessons can apply more generally to other ggplot2 geoms. 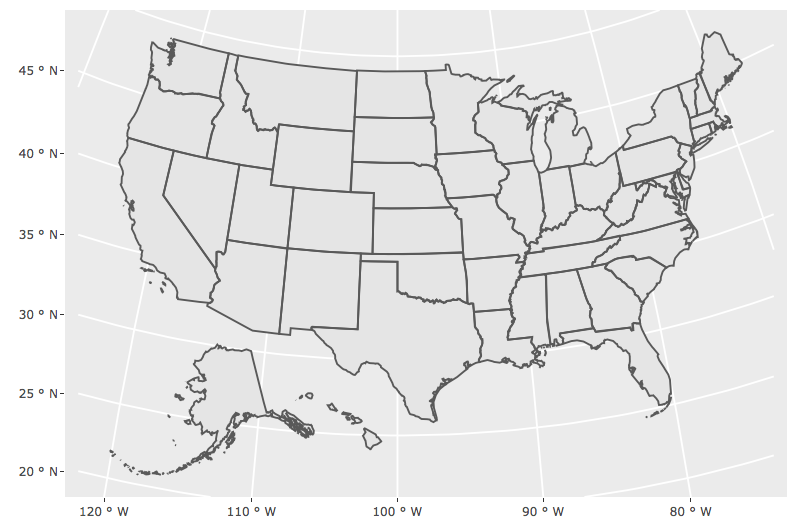 For a quick demonstration of geom_sf(), I’m using albersusa to access the laea projected boundaries of the United States as a simple features (sf) data structure, but sf also makes it easy to read various file formats and even convert various spatial objects to sf. 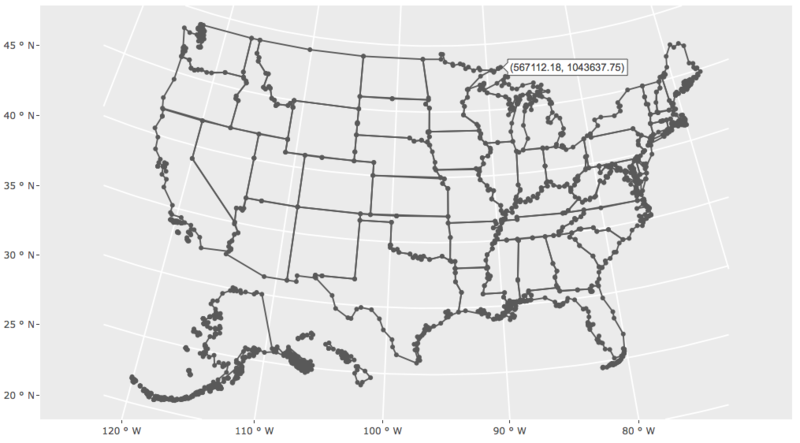 There are also a bunch of other R packages that, like albersusa, make it easy to query geo-spatial data as an sf data. The “Reverse dependencies” section of sf’s CRAN page is a good place to discover them, but just to name a few: tidycensus, rnaturalearth, and mapsapi. One awesome consequence of using sf is that, since the data structure contains all the geo-spatial information, both plot() and geom_sf() just workTM. The most brilliant thing about sf is that it stores geo-spatial structures in a special list-column of a data frame. This allows each row to represent the real unit of observation/interest – whether be a polygon, multi-polygon, point, line, or even a collection of these features – and as a result, supports workflows that leverage tidy-data principles3. Compared to older workflows (e.g., fortify() + geom_polygon()), this is a way more convenient and intuitive data structure (especially if your real unit of interest is the state). Moreover, sf tracks additional information about the coordinate system and bounding box which ensures your aspect ratios are always correct and also makes it easy transform and simplify those features (more on this later). It’s worth noting that sf is still very new, and improvements are constantly being made – to keep updated, check out the r-spatial blog. Inspecting the data component, we see that the map contains two 'scatter' traces, both with a mode of 'lines'. The first trace is the graticule behind the states and the second trace contains the state outlines which contain over 50,000+ x/y (i.e., lat/lon) positions! This is certainly not the most efficient way to create such a map and there are several ways we could improve upon it without abandoning the comfort of geom_sf().5 Before we dive into those improvements, lets first consider what happens when plotly generates a plot. 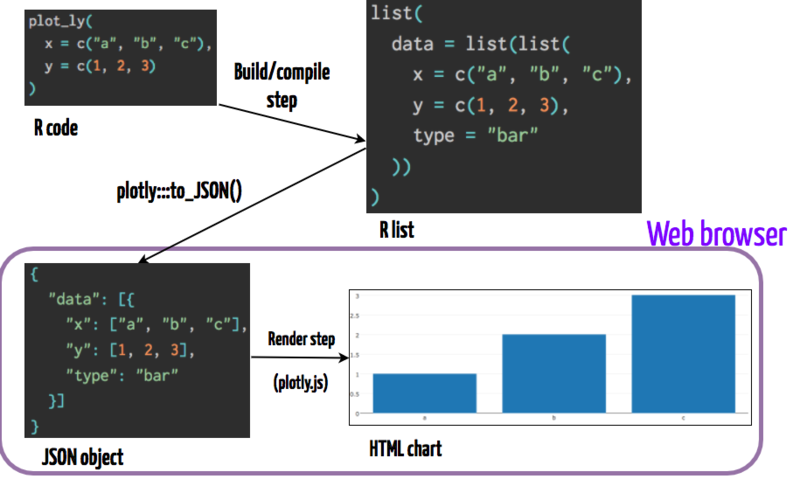 If you’ve ever found ggplotly() slow to print, chances are, the bulk of the time is spent building the R list and sending the JSON to plotly.js. For many htmlwidgets, the build time is negligible, but for more complex widgets like plotly, a lot of things need to happen, especially for ggplotly() since we call ggplot2::ggplot_build(), then crawl and map that data structure to plotly.js. In a shiny app, both the build and render stages are required on initial load, but the new plotlyProxy() interface provides a way to ‘cache’ expensive build (and render!) operation and update a graph by modifying just specific components of the figure (via plotly.js functions). Outside of a ‘reactive context’ like shiny, you could use htmlwidgets::saveWidget() to ‘cache’ the results of the build step to disk, send the file to someone else (or host it online somewhere), then only the render step is required to view the graph. A quick and easy way to try and improve render performance is to use canvas-based rendering (instead of vector-based SVG) with toWebGL(p). Switching from vector to canvas is generally a good idea when dealing with >30,000 vectors, but in this case, we’re only dealing with a couple hundred vector paths, so switching from vector to canvas for our map won’t significantly improve rendering performance, and in fact, we’ll lose some nice SVG exclusive features (the plotly.js team is getting close to eliminating these limitations!). Instead, what we could (and should!) 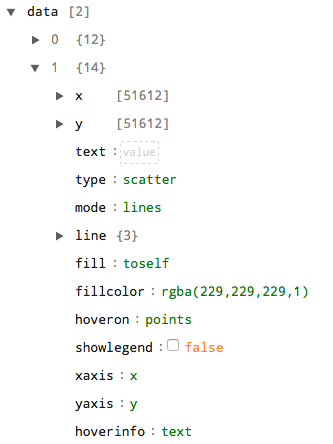 do is reduce the amount of points along to each path (technically speaking, we’ll reduce the complexity of the SVG d attribute). Thankfully, the sf package provides st_simplify() function that may be used to simplify polygons while still preserving their shape. A bit of trial and error is involved, but the idea is that by increasing the value of the dTolerance argument, you’ll decrease the number of points required to draw the spatial features. For fun, before simplifying, lets leverage some more sf awesomeness, st_transform(). This function allows us to transform our features to any projection via the proj4 standard. Here I’ll transform from laea to lcc, and in this case, a dTolerance of 10000 simplifies from roughly 50,000 to 2,500 points. On my machine, that cuts the build and render time in half and reduces the HTML/JSON file size from 1.7MB to 125.9KB. Now that we’ve simplified the borders, lets look into why there is no hover information. 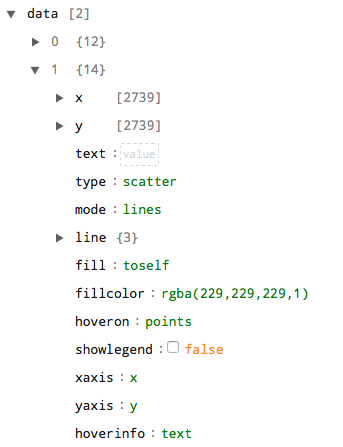 Since hoverinfo='text', plotly.js just shows the text attribute in the tooltip, but that attribute is blank! It’s blank because, by default, ggplotly() puts all aesthetic mapping information in the text field, but we haven’t actually used an aesthetic mapping here (geom_sf() is weird in that way – it is the only geom that doesn’t require any aesthetics)! We’ll eventually use aesthetic mappings with geom_sf() to create a choropleth map, but before we do, lets find out what the other trace attributes are doing (and find other relevant ones). schema() provides a bit more information than the online docs (e.g., value types, default values, acceptable ranges, etc). The interface makes it a bit easier to traverse and discover new attributes. You can be absolutely sure it matches the version used in the R package (the online docs might use a different – probably older – version). 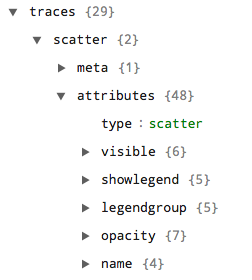 Go ahead and have a look under “traces” -> “scatter” -> “attributes”. These are all the attributes that may be used to control the appearance and interactive properties of a scatter trace. I won’t bother going through descriptions (you can see those for yourself by expanding an attribute), but I will demonstrate how we can leverage the style() function to modify just the state border’s attributes (specifying traces=2 ensures these changes are only applies to the second trace). After that deep dive into how ggplotly() works under the hood, and tips for improving rendering performance, let’s explore some lesser known, yet powerful ggplotly() features. As a side note, anything that can be done via ggplotly(), you can also do via plot_ly() (but not necessarily the other way round!) – it just might be more effort to do so. And, sometimes this extra effort is worth it, because ggplotly() isn’t really designed to be re-sized without being re-printed (get in touch if you want to help us solve this and other big issues). In fact, a lot of times, I prototype plots with ggplotly(), then translate it plot_ly() when it’s time to put it into production. At this point, we’ve learned how to turn a tooltip on/off (via hoverinfo), but perhaps more useful is the ability to completely control what appears in the tooltip. By using ggplotly()’s ability to translate a special text aesthetic with tooltip='text', we can effectively supply any text we want and even style it with HTML tags – as is done in this choropleth map encoding population in 2014. There’s a number of ways we could try to visualize how physical activity and/or obesity has evolved over the years. One way would be to create a small multiple display (one for every year via facet_wrap(~ year)), but it’s a bit less visual work to perceive differences via animation. 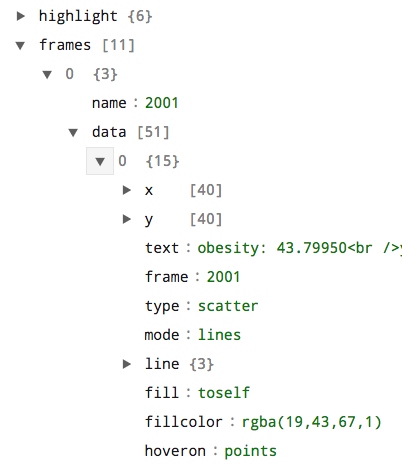 Creating animations with ggplotly() is very similar to gganimate – we just add an aesthetic mapping of frame = year. For a gentle overview of the linking framework, checkout my webinar from when it was initially released. If you’re interested in understanding the full power of the linking framework, my 2 day plotly for R workshop is the best way to learn it effectively. I also offer this workshop as an on-site training course, so please get in touch if you have any interest! Compared to other interactive mapping approaches, using geom_sf() + ggplotly() has it’s pros and its cons. It terms of it’s ability to link multiple views, it seems to be the most advanced, but there are a number of other features you might want (e.g., dynamic zooming of different baselayers). I think a good number of these can be resolved by using sf with plot_mapbox() and better support for that should be coming soon, but it would also be nice to see leaflet officially support more of the highlighting features that plotly does. I hope this post convinces folks that even when a ggplotly() conversion doesn’t quite work the way you want it to, we can still leverage the underlying plotly.js library to do powerful things quickly. My goal for the R package plotly has always been to make interactive web graphics practically useful for exploratory data analysis in R. If you’re interested in supporting a particular facet of this mission, please get in touch (it’s much easier for plotly to monetize plotly.js and dash, which is why R plotly development has dwindled recently).